Signed on Behalf of the Provisional Government. The Volunteers seized and fortified six positions In Dublin city: the GPO, the Four Courts, Boland’s Mill, St. Stephen’s Green, Jacobs Factory and the South Dublin Union. Attempts to seize Dublin Castle and Trinity College failed. This latter failure severely restricted the Volunteers mans of communicating with each other. The failure of the country to rise made it impossible to prevent the arrival of English reinforcements. By Wednesady the revolutionaries were outnumbered by 20 to 1. The English secured a cordon about the city and closed in. They concentrated their attack on the GPO whilst none of the other strongholds came under the same sort of concentrated bombardment. A gun-ship, the Helga, arrived in Dublin and field-guns were mounted on Trinity College. The effect of the continuous shelling of O’Connell St. virtually destroyed it and the surrounding areas. By Friday the GPO was engulfed in flames and Pearse gave the order to surrender. 450 people, many of whom were civilians, were dead with over 2500 wounded. The city was in ruins with the damage estimated at a massive 2 Million pounds. Over 3,500 people were subsequently arrested country-wide (including DeVelera and Collins), although 1,500 were freed after questioning. 1,841 of these were interned without trial in England, and 171 were tried by secret court martial resulting in 170 convictions. 90 were sentenced to death but 75 of these sentences were commuted to life imprisonment. The seven signatories of the proclamation of independence (Pearse, Connolly, Clarke, MacDonagh, MacDermott, Plunkett, and Ceannt) were all executed to the outrage of the Irish public who had now begun to revise their opinion of the insurgents to that of a heroic nature. 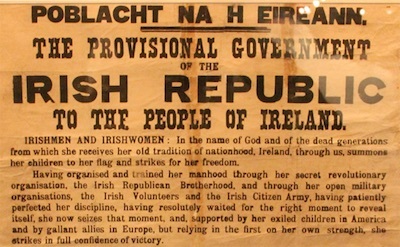 The rising was critical in terms of the overall fight for an Irish Republic. For the first time the masses of the country wanted an end to English rule. Nationalism swept the country especially as the details of the secret executions became known. National attention was brought to the Irish cause and to the oppressive ways in which the English ruled the country. These realisations were in all probability the main aim of the insurgents. The War of Independence which followed in 1919, the subsequent Civil War of 1922, the formation of the Irish Free State in 1923 and the declaration by Costello of an Irish Republic can all be traced back to the events of Easter week, 1916.